News on yesterday’s announcement by WCM that it had mothballed its U.S. operation that sells securities. Questions about whether a WCM777 event scheduled over the next two days in Houston would occur or whether TelexFree, a company under investigation in Brazil amid pyramid-scheme allegations, could become the “opportunity” promoted at the Houston event. News about confusion associated with a strange entity known as the Joseph Global Institute, purportedly operated by WCM777 executive Ming Xu. Ming Xu also is known as “Dr. Phil Ming Xu” and “Dr. Philip Ming.” A website associated with the Joseph Global Institute appears to have preemptively declared the enterprise a university that confers graduate and postgraduate degrees, but is showing videos that appear to be owned by Liberty University in Lynchburg, Va. The Liberty videos have led to questions about whether Joseph Global potentially is duping visitors into believing the Liberty students who appear in the videos are Joseph Global Institute students or whether Joseph Global is a California branch of Liberty. UPDATED 6:56 P.M. ET (U.S.A.) WCM777 announced yesterday on its website that it was out of compliance with U.S. regulations and thus had put its U.S. securities operations “on hold.” Whether the purported “opportunity” whose affiliates claim can cause $14,000 to turn into $500,000 in 52 weeks had been notified by WCM777 to stop pitching U.S. prospects is far from clear. The news of the U.S. halt first was reported by BehindMLM.com. Left unsaid by WCM777 in its announcement was how the purported opportunity intends to address potential claims from untold scores of U.S. residents, including residents who attended pitchfests in hotels and churches and who might have purchased its securities. It is known from public records that Massachusetts purchasers were offered refunds. On Nov. 14, the state alleged WCM777 was selling unregistered securities. The WCM777 announcement did not address whether the “opportunity” had reported itself to the SEC. Nor did it say whether it had been contacted by the SEC. Until yesterday, the company never had directly addressed the Massachusetts allegations, hinting only that things had to change at WCM777. Another major concern: If WCM777 is selling unregistered securities, so is its stable of thousands of promoters, including those outside the United States who can solicit U.S. residents over the Internet. In theory, any U.S. -based promoter or international WCM777 promoter who continues to pitch the “opportunity” to U.S. residents could be charged under U.S. securities laws or the securities laws of the U.S. states. Whether WCM777 has the ability to block U.S. registrations is unclear. Will The WCM777 Band Play On In Houston? Whether the WCM777 affiliate who runs the Wcm 777 Boston Facebook site will follow through with the plan to pitch WCM777 at the event — despite WCM777’s own confirmation it was operating illegally and was halting the sale of its own securities — is unclear. Continued sales of WCM777’s offerings could trigger even more scrutiny of the firm and its affiliates. Attendees at the Houston event who plowed any money into the WCM777 scheme all could become potential litigants against the Boston pitchman and WCM777 itself. If the Boston pitchman is aware or becomes aware of WCM777’s announcement before the Houston event and seeks to pitch something else, he may find himself addressing a confused and hostile crowd. The Wcm777 Boston Facebook site has associated itself with a street address in Boston, although the asserted phone number for the site uses an area code from a different region of Massachusetts. Whether the operator of the Facebook site had traveled from Boston (or elsewhere in Massachusetts or another state) to host the Houston event is unclear. Because the “Wcm777 Boston” Facebook site also references TelexFree in a Nov 10 post, attendees of the Houston event might find themselves getting pitched on that alleged pyramid scheme, too. TelexFree is under investigation in Brazil. 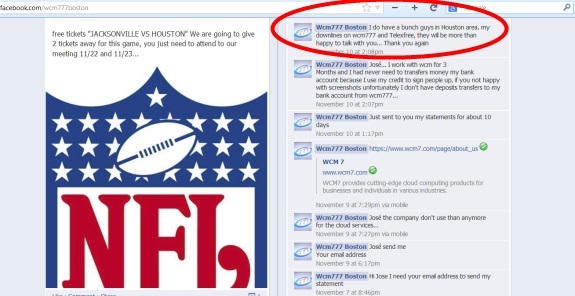 The Nov. 10 post reads, “I do have a bunch guys in Houston area, my downlines on wcm777 and Telexfree, they will be more than happy to talk with you… Thank you again.” It is positioned alongside the logo of the National Football League. The Nov. 1 post that reproduces the NFL logo contends that two lucky prospects who attend the Nov. 22 and 23 WCM777 event in Houston will receive free tickets to “JACKSONVILLE VS HOUSTON.” The game is set for Sunday in Houston. Whether Ponzi or pyramid proceeds were used to pay for the tickets is unclear. The YouTube claim raises the specter that individual WCM777 promoters are accepting national and international wires from WCM777 recruits and somehow later transferring the money to WCM777. Such practices have been associated with cross-border securities scams, including the infamous Imperia Invest IBC scam in which the SEC accused a promoter of creating at least two business entities and using them to wire money to the Imperia scammers outside the United States. Making matters even stranger is the wording of WCM777’s announcement that it was halting its U.S. operations in the aftermath of a Nov. 14 consent order it entered into with the state of Massachusetts, which accused it of selling unregistered securities and benefiting from an affiliate’s targeting of the state’s Brazilian community. WCM777’s announcement is dated Nov. 20, six days after the order in Massachusetts. The announcement did not explain the delay in addressing the Massachusetts allegations. Nor did it explain why WCM777 hadn’t previously announced it was under investigation, only to claim later that “negotiations” went well — as though it were common knowledge that the firm was the subject of a securities investigation. Moreover, the timing suggests that WCM777 continued to benefit from the sale of unregistered securities across the United States even after the Nov. 14 order. Beyond that, it is far from clear whether WCM777 even has control over its U.S. affiliate base or affiliate bases elsewhere in the world. What is clear is that WCM777 is positioned as an opportunity for Christians to prosper. The negotiations between our lawyers and the Massachusetts’ Office of the Secretary went well. We have reached a settlement with Massachusetts. However, because the sale of securities failed to fully comply with laws and regulations in United States, our operations in the U.S. will be on hold until further notice; WCM Limited will continue operations. The company will implement new compliance procedures and register with the SEC before selling securities. Our customer service, IT support, and sales training are far from ideal. Especially in sales training, we don’t have a proper system set up. Some of the distributors have exaggerated the sales performance, which has led to complaints. The company system also needs to be further improved to ensure global legitimacy. Under the counsel of the lawyer, WCM777 has already registered in the state of California. We will soon re-enter the U.S. market. Also, WCM777 will hold the grand opening for Hong Kong office in Dubai this coming January. We will restore WCM777’s promise and move towards achieving our vision! Why WCM777 would hold a “grand opening” for a “Hong Kong” office in Dubai is unclear. Dubai is a city in the United Arab Emirates. Also unclear is how WCM777 intends to comply with securities regulations in all 50 U.S. states, plus federal territories and districts such as the District of Columbia (Washington, D.C.). Because virtually all developed nations regulate the sale of securities, WCM777 may face challenges across the globe. The scheme already is under investigation in Colombia, and there are reports that Peru has concerns. Affiliates, meanwhile, now have been officially blamed by WCM777 for exaggerating the offering and causing complaints, a classic corporate narrative in the HYIP world. While it is clearly true that affiliates have made outrageous claims that reflect their own lack of due diligence on the purported “opportunity,” it is equally true that WCM777 has advertised that a payment of $1,999 returns $3,200 in 100 days. An entity tied to WCM777’s purported operator Ming Xu — the Joseph Global Institute of Pasadena, Calif. — appears to be implying it operates a university that offers a “College of Engineering,” a “College of Health, ” a “College of Media Arts” and a “College of Business.” A website using the Joseph Global Institute name is accessible through a website that uses the famous name of “Harvard” as part of the URL. The site shows images of smiling, college-age students wearing graduation caps and holding what appear to be degrees. Other smiling students are shown studying in front of something that resembles a university hall. Visitors to the site are prompted to watch three videos, but there are no disclaimers or language that the action shown in the videos isn’t taking place at Joseph Global. All three videos appear to be owned by Liberty University, a large Christian university in Lynchburg, Va. Nothing on the Joseph Global Institute site, however, identifies the videos as belonging to Liberty and not to Joseph Global, a potential source of confusion. Why Joseph Global appears to be implying that it operates a university is unclear. Liberty University did not respond to a PP Blog request for comment about whether it was aware of the Joseph Global site. But The Way TV is something that launched years ago, through an entity known as Media for Christ. Media for Christ is based in Duarte, Calif. — and has a history that includes being at the center of an international firestorm. That firestorm centered on the inflammatory trailer of a film production known as “Innocence of Muslims,” which has been described as anti-Islamic and denigrating to the prophet Muhammad. Joseph Nassralla Abdelmasih, the president of the Duarte-based charity Media for Christ, and Nakoula Basseley Nakoula, a convicted felon from Cerritos, emerged Thursday as forces behind “Innocence of Muslims.” An online trailer for the low-budget film incited violence in recent days across the Arab world. What was supposed to be a film about members of one faith persecuting members of another turned out to be something quite different: a film that portrayed Muhammad, a sacred figure, as a buffoon. Now, the Twitter site under the name of WCM777 figure Dr. Phil Ming Xu is claiming it is “launching” The Way TV, something Nassralla already has launched. The Twitter site further claims the launch extends to the Joseph Global Institute, apparently the same entity that is advertising its operation of various “colleges” of higher education and showing website visitors videos of Liberty University students. A letter attributed to “Dr. Bruno Caporrimo” at the site references the city of Duarte, the home of The Way TV and Media for Christ, the Nassralla enterprises. Caporrimo is referred to elsewhere online as a former Mafia member who found God. My name is Dr. Bruno Caporrimo, Chancellor of Joseph Global Institute. At J.G.I. we have been training men and women for full time ministry, in a formal classroom experience as well as helping individuals gain a greater knowledge and understanding of the bible in order to fulfill the mandate of God’s calling in their lives. Our curriculum offers important bible doctrines in addition to the School’s emphasis on the practical side of ministry. It is our desire to see the world evangelized and we believe that if people are trained and equipped, from the standpoint of their local church and community, that this mandate from the Lord Jesus Christ of Nazareth can be effectively realized and fulfilled in our generation. We currently have students from 50 different churches and from more than 10 nations around the world enrolled in Joseph Global Institute. J.G.I. has equipped and discipled into full and part time church and para-church ministry, over 5,000 students and they have embarked on their personal calling to fulfill the one great Commission of Matthew 28:19. Whether you plan to study through our International headquarters & ‘Global Student Network’™ in Duarte, California, or through our Distance Learning and online Correspondence Courses™ we are sure that we have the tools and resources to launch and elevate your personal and ministerial calling SO THAT YOU CAN bear much fruit for the Lord Jesus Christ and to operate in faith, diligence and integrity for God’s Kingdom. The URL cited for the Joseph Global Institute in the video — TheJoseph.org — now rotates to a parked page for Sedo, a domain seller. Another website associated with the Joseph Global Institute — JosephGlobalInstitute.com — shows some students holding books and others receiving degrees at a graduation ceremony. The JosephGlobalInstitute.com site uses the same logo as the website that uses Harvard’s name in its URL. The logos are similar in appearance to the logo of the actual Harvard University. Also see coverage on the MLM Skeptic Blog about a purported Ming Xu entity known as the Harvard Global Institute. Is Phil Ming Xu relaunching “Manna TV” as “The Way TV” to confuse people? If so, he picked a very bad name, as you pointed out, PP. Patrick, I just realized something. In that photo tweeted by Ming Xu, I think that guy on the left IS actually Joseph Nasralla, “previous” owner of The Way TV and Media for Christ! That guy on the right is “Dr” Carlo Bruno Caporrimo, ex mafia boss, etc.. Turning my sights onto him, not much to be found as of yet (some foreclosures in AZ, Family stuff in HI)..